Based on reviews from 2,054 users. Learn how our rankings work or see our guide to Adidas Samoa sneakers. Updated Apr 2019. The Adidas Originals, a sub-branch of Adidas, was introduced in 2001 that features shoes inspired from the high-performance kicks, revamped to fit the lifestyle scene. All the sneakers under the Adidas Originals use the Trefoil logo to pay homage to the heritage profiles from the 40s up to the 80s. These sports-inspired casual sneakers are offered in a vast collection of colorways to suit diverse preferences of its followers, such as white, black, blue, red, gold, silver, green, yellow, orange, pink, brown, beige, and purple. Aside from the colorways, Adidas Originals also uses a wide range of heritage profiles to re-introduce, re-interpret, and re-design for the modern market. These inspirations are from basketball, skate, running, training, hiking, football, and tennis silhouettes. These Adidas shoes called Samoa was launched in 1977 and turned as one of the most popular training shoes for indoor football. This low-top kick showcases full-grain leather upper with suede overlays on the toe box for durability and style. Although underrated, the Samoa silhouette has remained relevant over the years. 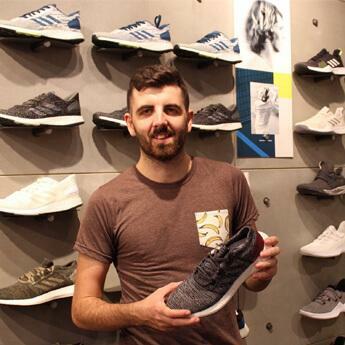 The brand has launched various colorways and special editions and was used as inspiration to one of the popular kicks of the current market, the Adidas Iniki. The Adidas Originals re-introduced the Adidas Samoa in August 2011, together with other iconic kicks such as Adidas Gazelle, Adidas Campus, and the Adidas Superstar. These sneakers were revamped to suit the modern athleisure trend. The brand kept the clean yet bold aesthetics of Samoa in several colorways for that street-ready look. The Trefoil logo found on the tongue, and the metallic Samoa typescript on the side kept this model on top of the most iconic designs in the market. Rubber toe bumper for durability and protection. Slim midsole seated atop a rubber outsole with the Trefoil pattern all over. Rubber or suede upper with suede overlays on the toe box. Adidas offers this at a budget-friendly price range of $70. Men have a size range of 7 to 14 while women have a size range of 5 to 11 US both in medium width. Staying authentic to the 70s and 80s vibe, the brand offers its Samoa silhouette in various bold and subtle hues. A colorway that resembles the green boards where chalk is used. Black-Red-White. The upper is dressed in leather with red retro Trefoil and 3-Stripe logo. Grey-Cloud White-Talc. Grey leather upper has white Trefoil and 3-Stripe logo. All-White. This monochromatic kick displays white from the upper down to the midsole. Trace Khaki-White-Gold Metallic. This unicolored kick displays a metallic Samoa logo. Collegiate Navy-Gum. These men's Adidas Samoa casual kick highlights the gum rubber sole. Poppy-Running White. The single-toned upper down to the midsole is contrasted with flat white laces. Black-Poppy. The red laces stand out on the all black leather upper and rubber midsole. Launched in 2016, the Vintage Samoa model of the classic Samoa comes with premium suede upper seated atop a cushy EVA midsole and the classic Samoa element, the toe bumper. Many wearers love the retro appeal of the Adidas Samoa Vintage that can be styled with any modern-day ensembles. This kick is offered at a wallet-friendly $65. Men have sizes 5 to 13 and women have sizes 5.5 to 10 US both in medium width. This modern version of classic Samoa displays 3D printed puff stripes throughout on its premium leather upper in striking colorways. This kick preserved all the iconic elements of Samoa, including the reinforced toe cap and the slim rubber sole. This street-ready, low-top kick radiates youthful vibe without sacrificing the lightness and overall comfort. The German brand incorporated EVA-injected midsole with durable rubber outsole for soft strides and cozy ride. This affordable kick has a price point of $75. Women's Samoa Plus shoes are offered from 7 to 14 while men's have sizes 5 to 11 US in medium width. This Leather edition of the Samoa silhouette displays the basic look of its ancestor but upgraded with the full-grain leather on its entire upper and its overlay on the toe box. The brand added a light padding on the collar and tongue and the mesh lining to enhance the comfort and breathability. This reasonably priced shoe is offered at $70. These Adidas Samoa for men's shoes are presented from sizes 4 to 15 while women have a size range of 4 to 11 US in medium width. In 2016, Adidas revived Samoa into a luxurious version by wrapping the classic silhouette with pigskin with suede treatment conceiving these new Adidas Samoa shoes. Adidas Originals collaborated with Woodie White of the Oyster Holdings to come up with three unique tonal colorways of modernized Samoa. In the fall of the same year, Adidas unveiled two follow-up colorways of the Adidas Samoa Vintage Pigskin as the brand's way to introduce alternatives to the popular street kicks staples found in the market. This affordable sneaker is available at $120. Men can choose from sizes 5 to 13 while women can pick from sizes 6 to 11 US in medium width. Adidas has been a hustler in re-introducing their classic profiles by jamming it with newer technology. The classic football kick was upgraded into a high-performance kick in the mold of the Adidas Samoa Torsion Flex. The Samoa profile rides the Adidas Flex outsole for the rugged look while providing better comfort and support compared to the usual casual kicks. The bulky, bright white sole provides maximized flexibility and more support. Meanwhile, the upper has been upgraded, too, with premium leather and modern details, such as the glossy 3-Stripe logo and the Samoa label on the side. To provide an adjustable fit, the brand used waxed round laces reinforced with the silver eyelets. Price range is at $100. Sizes are offered in men's range from 6 to 12 US in medium width. 1. How to clean the Adidas Samoa shoes? It is recommended to clean out any visible dirt on the surface of the leather and leather that can be scrubbed off using sneaker cleaner or mixture of lukewarm water and mild detergent soap. Take off the shoelaces and soak them in your soapy solution. Take the removable insoles out and mildly brush or wipe the dirt off. Use a brush with soft bristles or clean cloth soaked in gentle soap and lukewarm water when cleaning your shoes. Air dry is the most recommended method, and it is recommended to avoid using the washing machine as it can deform and break your white sneakers. While air drying it, you may dust it with baking soda to eliminate any awful odor. 2. How to wear the Adidas Samoa shoes? Basic pieces when paired with Adidas Samoa will surely give a classic, laidback look. Essential items such as a plain t-shirt and a pair of denim jeans will certainly look great with the Adidas Samoa. For the on-trend look, some wearers add unbuttoned polo over their plain tees and pants, with the men's Adidas Samoa casual shoes for cool, spring-ready ensemble. Dark skinny jeans that hug the ankle looks great when paired with the Adidas Samoa. This ensemble allows the on-lookers to have a better view of the stylish look of the Samoa kicks. You can also pair this kick up with cuffed jeans or rolled-up trousers for a tight-to-the ankle look that gives this kick a better display. Shorts or mini skirt can also work well with the women's Adidas Samoa casual shoes especially during the summer days for that relaxed and laidback vibe. Shirt dresses for the ladies is also an excellent choice with the Adidas Samoa. Because of the sports heritage of Samoa, you may also pair it up with gym-ready attire, such as tracksuit or Dri-fit clothes. 3. Where to buy Adidas Samoa sneakers? The Adidas Samoa shoes can be bought in the official stores and online shops of the Adidas. Many Adidas' partner retailers also offer this iteration in their physical stores and on their websites. Such partner retailers are the Amazon, Eastbay, eBay, Zappos, End, Caliroot, Zalando, Finish Line, and many more. Meanwhile, to give you an easy and pleasant online shopping experience, the RunRepeat team have collated reviews from countless websites about the Adidas Samoa. We have carefully ranked them according to their CoreScore, which may help you decide which Samoa iteration you will order. You may type 'Adidas Samoa' on our search bar or simply click this link. 4. When did Adidas make Samoa model shoes? The first Adidas Samoa was unveiled in 1977 as training sneakers for the football. It was reintroduced to the market by Adidas Originals in August 2011 as a casual lifestyle sneaker. 5. Why are Adidas shoes called Samoa? The Adidas Samoa was said, but not confirmed, named after the underdog football team called American Samoa National Football Team after losing against the Australian team during the qualifying games in FIFA. Although they lost, the Samoa team managed to finish the game with utmost pride. 6. Where are Adidas Samoa shoes made? Adidas usually add label their shoes that gives information about where that shoe was made from. You may check in under the tongue label and look for the 'Made in' information. Meanwhile, to cut down the overall expenses of the company, Adidas distributed its factories all over the world and repeatedly updates its list of suppliers and manufacturers. Most of the shoes of the Adidas are made in China, India, Turkey, India, Indonesia, Vietnam, Japan, Korea, and many more. 7. Do Adidas Samoa runs true to size? Most of the Adidas Samoa kicks runs true to size. For more specific details on the fit and sizing of the Adidas Samoa iterations, you might want to check each Samoa models published in our site. 8. Are Adidas Samoa sneakers durable? The Adidas brand became a popular brand worldwide for its products that are stylishly incorporated with innovative technologies and unmatched durability. Therefore, the Adidas Samoa shoes are also considered durable, but its lifespan depends on how the wearers use their Samoa. If the shoes are worn only for streetwear and if properly maintained, this kick will surely last. 9. What is the price range of Samoa shoes? The Adidas Samoa is offered from $65 to $120. The most affordable model is the Adidas Samoa Vintage while the most expensive is the Adidas Samoa Vintage Pigskin. 10. What is the meaning of the Trefoil logo found on the Samoa kicks? Adidas has been using the Trefoil logo since 1972, just in time for the Olympic Game in Germany. This logo showcases three leaves that form a flower-like shape added with a noticeable 3-Stripe on the bottom half part. The Trefoil logo was used by all Adidas products until 1997. The brand chose this logo as this symbolizes that its products are more significant and diverse while keeping all the heritage elements. Today, the Trefoil logo is used by the Adidas Originals to pay homage to all the silhouettes from the archives of the Adidas that have been revamped to suit the modern market.